I do a lot of closet organizing and see a variety of home made and professional installation systems. Even the biggest and most well-designed closets can have organizational problems. What if you have a tiny closet or simply too many clothes like most of us? A quick and easy fix-it starts with analyzing the type of hangers you are using. We accumulate a variety of hangers over time: colorful plastic tubes, bulky wood, padded sweater and metal dry cleaning hangers are common. 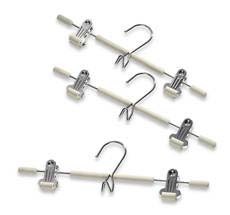 Tube hangers are sturdy, inexpensive, easy to acquire, and are used for just about everything: blouses, t-shirts, sweaters, dresses, folded over pants and skirts. They range from slim to bulky. If you have collected a variety of these colorful hangers…beware! It makes the closet look messy and clothes tend to slide off their smooth surface. Plastic is a material I suggest be phased out of the home altogether, and considered primarily for garage, attic and basement storage containers. If you prefer plastic tube hangers, use the same size and color for visual consistency; this alone will make the closet look and feel more organized. Padded sweater hangers are cute and remind me of babies. They are meant to prevent stretching at the shoulders, but I have witnessed stretching just as well. They also take up a lot of space and are difficult to slide across a hanging bar when searching through the closet. The key to preventing hangers from stretching sweaters is 1) wear them regularly, and 2) fold and stack sweaters instead of hanging. Wood hangers are good to use if you have the space. Whatever material they are made of, consistently sized, shaped and colored hangers give the closet a sleek and minimalist look and feel. Slim wood hangers are nice looking, sturdy, and one of the natural materials I prefer for the home. They are sturdier than most hangers and good for large and heavier clothing, suits and jackets. Since they are bulky, I do not recommend them for lightweight clothing unless you have ample closet space. Dry cleaner hangers are a tough one. Why bother transferring clothes onto regular hangers when they are already hung when picked up from the cleaners? They are slim and sleek therefore do not use much space, and are made of a natural material…sounds like perfection, doesn’t it? 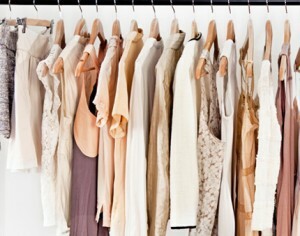 If you don’t mind the way your closet looks and how your clothing hangs with dry cleaner hangers, then go for it. If you wear the same dry-cleaned clothes every week it makes sense to consider keeping and using them as your regular hangers (please at least remove the plastic bag covers!) If your clothes will be hanging for a while, transfer them onto better hangers, for safe storage and aesthetics. Otherwise, your clothes may lose their shape quicker. I have also witnessed rust deposits on clothes formed by metal hangers. They also bend out of shape quickly and snag other clothing. Slim, velvety hangers maximize closet space. Slim velvet hangers of the same size and color give the closet a sleek, minimalist look and feel. They have a velvety finish, chrome or nickel hooks, and a good shape to the shoulders, which helps keep clothes from stretching and slipping to the floor. They work well for most lightweight tops and tanks, and are almost completely flat allowing you to hang many items close together, creating space where there was none. Cascading hangers with clips further maximize space. They allow pants and skirts to hang their full length, keeping them wrinkle free. The ones shown here have a small hook to hang them on one another, allowing you to maximize vertical space. Theses hangers keep their shape over time and can hold a lot of weight without collapsing, unlike plastic tube and dry cleaner hangers. Cascading hangers for pants and skirts keep them wrinkle-free and maximize vertical closet space. 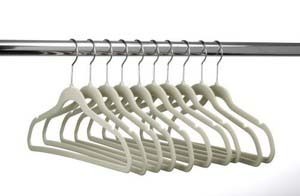 Choosing the right hangers can create space where you did not know you had it. Slim velvet hangers, slim wood hangers and cascading pant and skirt hangers are great choices for streamlining your closet for function and aesthetics. Maximize space by adjusting the type of hangers you have; it is an easy and inexpensive way of making the most of a small closet without sacrificing style or durability. Ready for more? Call (510) 229-7321 today to schedule a complimentary estimate for your closet and wardrobe organizing goals. Gift certificates are available. Keep up with Bella Organizing on Facebook and Instagram. Call 510-229-7321 for a complimentary telephone assessment. All Rights Reserved. Copyright © 2018 Bella Organizing. Terms of Service .